Art is a fantastic tool through which to express our activist spirits. Art can transport us from the mundane to the sublime and from the ordinary to the fantastic like nothing else. Our creativity is our personal force for creation. We can breathe life into concepts and content into form. Art gives us the vehicle that lets us raise the causes we are passionate about above the fray and allows us to embrace them, understand them, and re-imagine them. I see no split between art and activism. Picasso’s “Guernica” may well be the most powerful anti-war message and artistic political statement of all time. This monumental painting depicts the suffering and terror in the chaos of the bombing of the Basque town Guernica on April 26, 1937 during the Spanish Civil War ... It engages us in an entire range of intellectual, emotional, and visceral responses to the carnage and asks us to witness, assimilate, and stop for future generations. Film is also a perfect vehicle through which to explore the issues that we face and the changes that we want to make in society. “The Cove,” which won the Academy Award for Best Documentary, won the Audience Award at Sundance, and the SilverDocs and Hot Docs Festivals, is such a film. “The Cove” is an extraordinary and beautifully rendered documentary that plays like an adventure film, and proves once and for all that truth is every bit as exciting and compelling as fiction. The action of the story follows director Louie Psihoyos and dolphin trainer Ric O’Barry, who long ago captured and trained the 5 dolphins who played Flipper in the world-renowned television series of the same name, as they seek to stop the annual killing and capturing of dolphins for food and for entertainment. 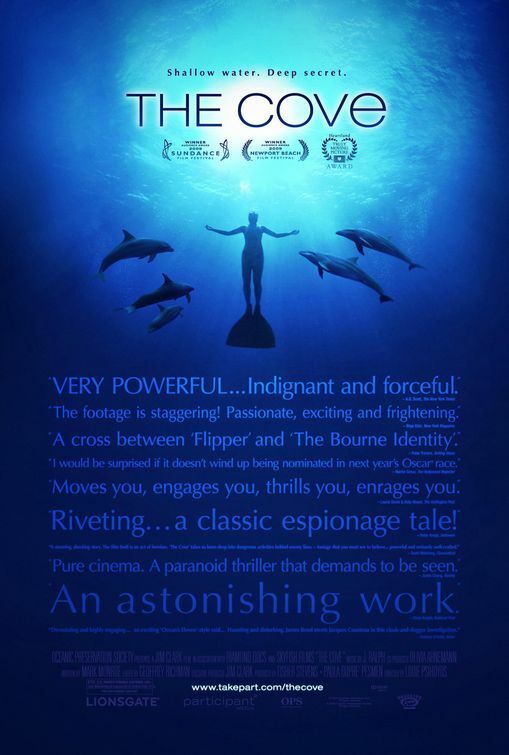 The action takes place as a dedicated and passionate group of activists, filmmakers, and divers expose the “dark and deadly secret” that is revealed as they focus their attention on a lovely hidden cove in Taiji, Japan. The advertisement for this absorbing film describes it as being: “complete with bugged hotel rooms, clandestine derring-do, and even mysterious men in gray flannel suits.” I found myself, along with the rest of the audiences both in theaters and at the screenings I went to, rooting for the good guys and longing for everyone to see this film so that the fate of dolphins, wonderful animals that despite the smiles on their faces do not flourish in captivity as we have been lead to believe, could be changed. “The Cove” has done far more than entertain and inspire audiences, it has opened up a channel for animal activism against the killing and capture, as well as using dolphin meat as food. The director of a secretly filmed documentary that shows the annual dolphin hunt of a Japanese town said Tuesday he'll give the town the profits from screenings in Japan -- if they end the hunt. Psihoyos, who could face arrest for trespassing from making ''The Cove,'' arrived at Tokyo International Film Festival and said he was prepared to face all the consequences of making the documentary. Police have repeatedly questioned the covert shooting of key footage in the documentary, which shows fishermen making noise to drive dolphins into a hidden cove and killing them with spears. The documentary has set off an international uproar among conservationists, and the tiny coastal town of Taiji has said it has stopped killing dolphins. The annual hunt brought in about 2,000 dolphins a year. You can become involved in various aspects of bringing awareness and change to the way we experience and treat these magnificent, intellegence creatures.